Washcloths -- on sale for $3.99/6 instead of $9.99/6. My total was $33.50 before shipping & tax (regular Kohl's retail price would have been $129.87). A savings of almost 75%. With shipping and tax my per washcloth price came out to about 50 cents each. That is quite high compared to Dollar General or Walmart's 18 packs for $4.00 (Walmart's 8 packs are $4 -- so the same price I got), but I like the quality of these and decided I'd splurge as I knew I was to receive $80 towards shoebox supplies next month. You can check out all of our shoebox stockpile additions here: Shoebox Stockpile Saturday ~ Adding to Our Operation Christmas Child Shoebox Stockpile. 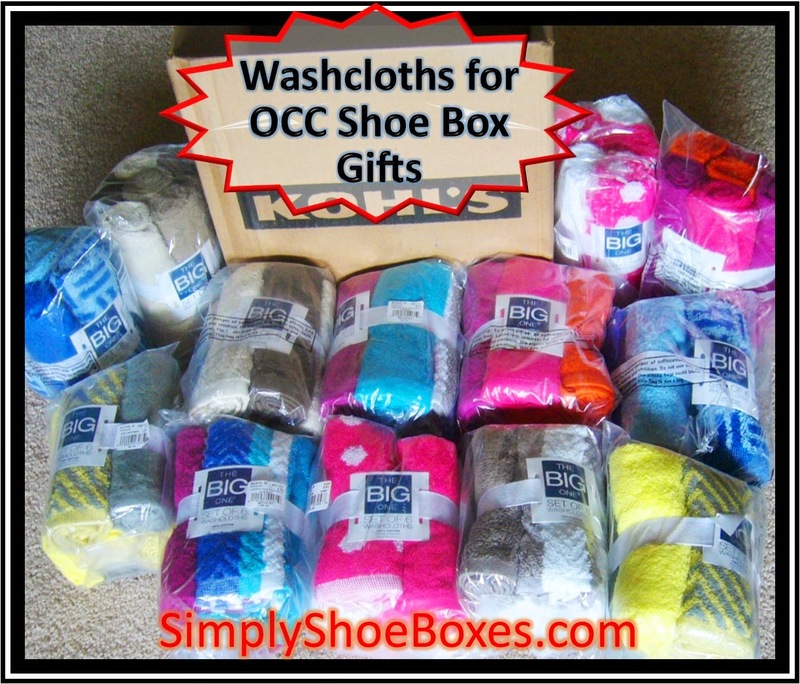 If you want to learn how to win prizes on blogs check out my post How To Find and Enter Blog Giveaways for Packing More Operation Christmas Child Shoeboxes. love that U got so many!! And, all those color combos were not in the stores.